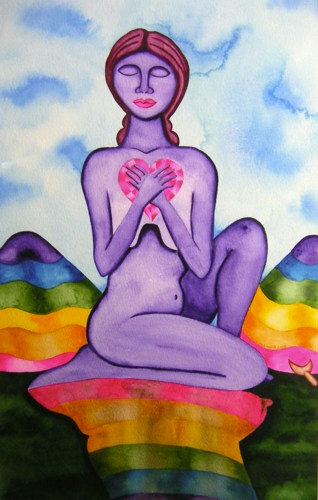 On our paths of returning to love, there comes a time for us all when we are called to heal our hearts. Whether it’s childhood traumas, a painful breakup, the loss of a job or death of a loved one that triggers it, when our hearts break apart, a door in our soul opens. Of the countless ways we can begin the journey of healing grief, there is one that has the power to transform us wholeheartedly: the way of meditation. Once learned, meditation becomes a lifelong ally supporting us not only in releasing all the blocks to having a happy heart, but also in unleashing the infinite source of love that is already and always within. How can such a simple tool accomplish such a great feat? With consistent practice of even five minutes a day, meditation gently yet powerfully takes us through an inner process that transmutes the darkest pain into the deepest peace. It’s impossible to defeat an enemy we can’t see. If we don’t take the time to actually be with our feelings, we can’t start working through them. This is why the first way meditation helps us is perhaps also the most important: it sheds light on what is. By observing our innermost thoughts and feelings without judgement, buried pain comes out of hiding and up for healing. Often, our awareness alone becomes the catalyst for transcendence. What we resist persists, and this is painfully true when we’re fighting desperately to escape heartache. Sometimes when we become aware of our darker emotions, instead of celebrating our increased consciousness, we feel even worse about having them. Through meditation, however, we become the compassionate witness of whatever shows up, allowing all our repressed and negative emotions the chance to be seen and honored. When we welcome all our feelings without analyzing, indulging or undermining them, our hearts start entrusting us with their most secret scars. As we give our emotions the expression they need, meditation further enables us to choose a conscious way to respond to them instead of being burdened and bound by them. For example, when we notice painful patterns, instead of identifying with them as we normally might, we can instead acknowledge them and then say a silent statement like, “Thank you, I bless and release you.” Then, we can gently bring our awareness back to our chosen anchor (third eye, mantra, heartbeat, etc. ), repeating the process if necessary and feeling freer and lighter with each breath. With committed daily practice, meditation can eventually take us far beyond healing our hurts. It takes us much deeper than our pain. It leads us to our truth. It takes us back home. “Be still and know that I am God,” reminds us all that through stillness, we reconnect with our sacred selves. After observing, allowing and honoring our feelings, we at last find refuge in our inner sanctuary, the abode of endless bliss. This is the ultimate goal and gift of meditation—the direct route back to our true origin of eternal light and love. No matter what state we may find our hearts in right now, meditation is one of our most accessible and powerful means to release all the barriers that keep us from healing and flourishing in every way. With only a few minutes a day needed to reunite with our souls, it’s a small investment with a priceless return. Originally published on My Yoga Online/Gaiam TV here.